In this brand new adaptation of the classic Robin Hood story there’s a true local twist. Featured are all of the essential characters for a true and faithful telling of the story – but there’s also a few surprises in there too!!!! Within this action-packed story are frequent swords, swashbuckling and a catalogue of festive fun and jokes! You won’t want to miss it! We are proudly supporting NEH (North East Homeless) again during this production. 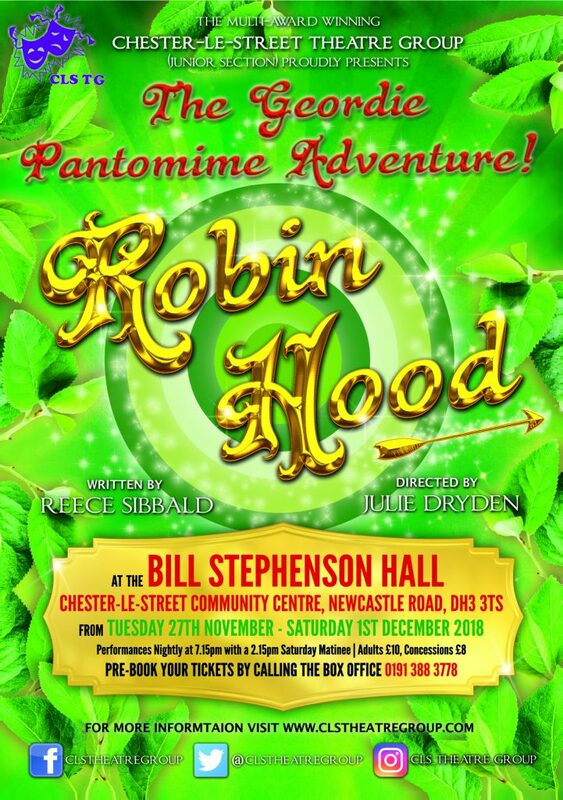 Like our hero Robin Hood we would like to share our fortune with those less fortunate, so from now until closing night we shall be collecting items such as thermal socks, gloves & hats (no scarves), toiletries such as hygiene wipes, deodorant, feminine items etc (no aerosols), underwear (new), sleeping bags and insulated flasks/cups to help our street friends through the winter. Any donations will be gratefully accepted and passed on to NEH after the show. For anyone wishing to donate collection boxes will be placed in the Community Centre or donations can be given to cast members who will pass them on. Thank you for your support.